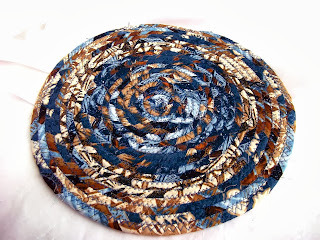 A few customers have asked me to make a basket using denim. So here is a denim prototype. Denim is a heavy weight cotton and thus more bulky to work with. It is a very loose woven cotton and the fray is more than usual. I love this cute denim with the embroidered flowers, the white fray adds a nice contrast. After wrapping you can see how bulky the denim is which causes more lumps, so I press rows together hard when sewing each row. I love this denim basket! I think the white fray adds a fun texture, but if you prefer, trim all the loose threads. I will try a lighter weight denim next, so I can compare the amount of fray. I think I should try a dyed denim too, so the fray would be blue. This basket was made using denim purchased at a fabric store, not an old pair of jeans. Most jeans' seams have serged edges to prevent fray, but I like the fray, since it adds alot of texture to my baskets. When you look at the above basket would you know that the fabric was a zebra print? I love this fabric for the color and contrast! The fabric character changed from an animal design to an abstract design. Fun! Here is a striped fabric! It changed character too! 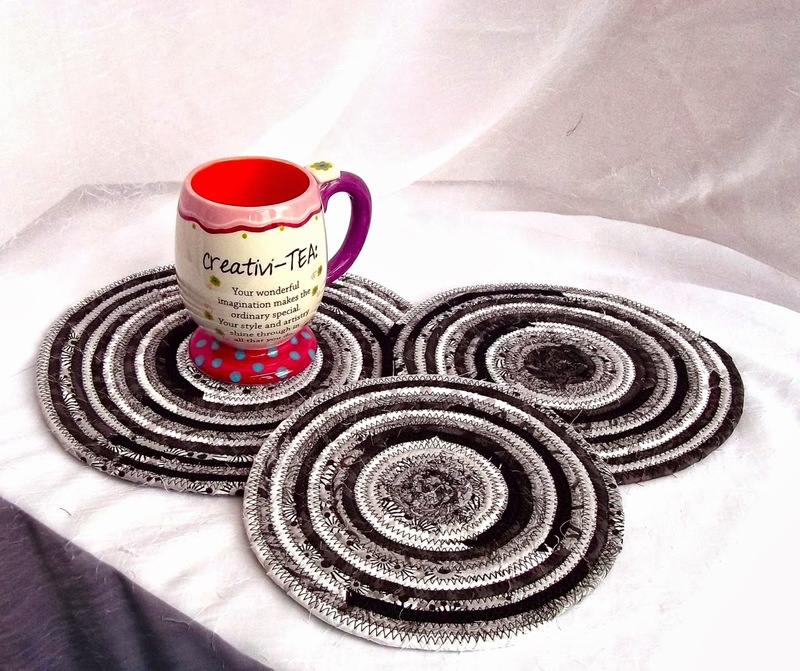 Love the swirl created in these trivets! Here is another stripe! But in the oval shape it doesn't swirl as much! This lovely floral does read as floral, but a very unique flower is created! I think you can tell this is a leopard animal print. This fabric has many shades of leopard spots. Not many fabrics can keep in character, since I wrap on the diagonal, this is one of a few. So what is this pink and white fabric? I love the pink and black contrast! Could you tell they were horses? I have been making these lovely baskets for over 3 years. I enjoy designing them and creating them using lovely fabrics. 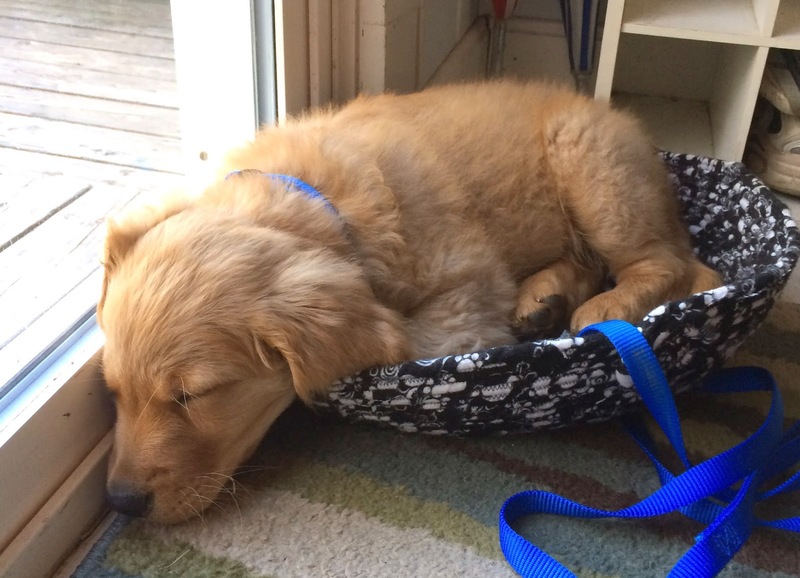 My baskets are very sturdy! I double stitch some seams where the line is lumpy and bumpy to make sure they are strong. I double stitch the center of all baskets, since that is where the most strength is needed. These are hand crafted baskets and unique. baskets, trivets and now beautiful necklaces too. over the basket to give it some texture. My cat can not eat the threads since they are quilted down on both sides of the strand. I have machine washed her bed and it has frayed a little more. Most fabrics will fray some more, I just give it a trim if there is too much. There are only a few cottons that I have to trim, the loose weave ones. Lovely batik fabrics don't require any trimming and wash very well. I spot clean first to make sure the colors don't run. Trim just the threads that are sticking out, not the seam zigzag stitches. As you can see, this lovely basket is still flexible. It is not stiff like metal or wicker. It is strong, but the shape can change if it is overloaded. I overload my baskets all the time and they do not break, they just reform to a bulky shape. My little kitty loves her curved basket/bed. This type doesn't bend over as much when she stretches. She loves to curl up in side and let the sides form to her shape. Some times there is a bulge on one side where her feet are pushed against the inside. When she pops her head up over the top on this curved bed, it folds in on her, so she cushions her head right on it. I love the itty bitty baskets, they are so useful for keys and change. This size basket is not as flexible, so it keeps it shape even when overloaded, but it will fall over just like any other bowl. 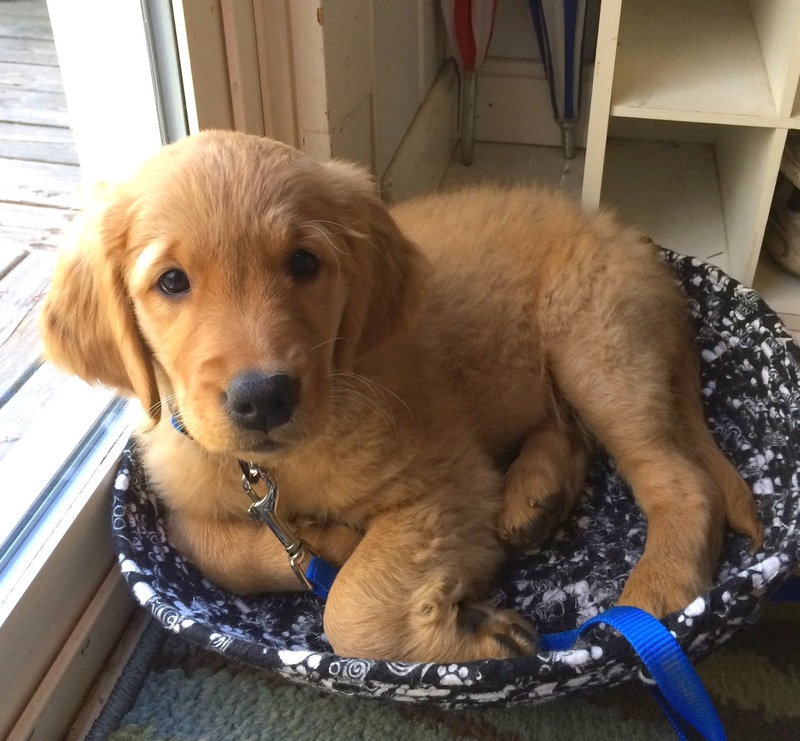 Here is my little Koda in his bed! He loved the flexible sides, he could move around and the basket would form right to his shape. He is so big now! Miss kitty took over his bed! I made myself a necklace with a lovely ceramic button and just love it. I think I will just have to make more for summer. I created this necklace by wrapping a wonderful olive green batik around cotton line. The line is .25" thick and is lumpy in places since the line is not perfect. The fabric raw edges have some fray, so this Skinny Necklace has a great shabby chic character. The button it tied on with a leather strip. It is tied around 2 strands, so I can play around with the length of the other 2-3 strands. I love the 4-6 strands at different lengths, so this infinity necklace is 150" long (or about 12 feet). Oh I love batik fabrics! This necklace has a wonderful Boho style. I used a decorative stitch to make sure the fabric does not unwrap from the line. I have machine washed my Boho necklaces and found that batiks do not fray as much as some other cotton fabrics. I love twisting this necklace into many different shapes, so it never looks the same! Is this a necklace and a skinny scarf? How about a string skinny necklace? I used the same love olive green batik fabric, just a different length, which I think is very nice. It looks more rustic without the button. Here is a lovely Bamboo Green Batik necklace. I think this summer green batik creates a wonderful modern necklace. I love the simplicity. There are so many decorative stitches to use, so it will be fun to see which ones work the best. I am washing a couple of necklaces many times and I will post the results later. Regular cotton did fray on the first washing with hot water and heated dryer. And on the second washing too. The batiks don't fray much even with the hot water. I don't recommend hot water and a hot dryer, this is just for testing. I will check for shrinkage and post that later too. Please feel free to post any suggestions! Coaster or Trivet? You decide! 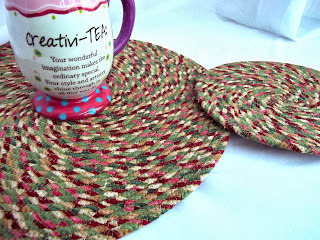 To make a 3.5" round coaster, you need to wrap 36" of line. I wrap my line very tight and only use high quality cotton fabric. 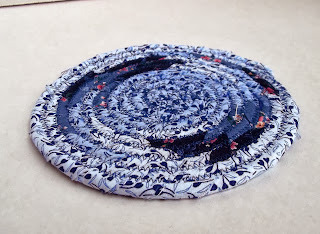 Wrap 56" for a 4.5" round coaster! Wrap 72" for a 5" round coaster! 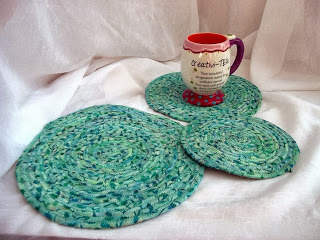 Wrap 108" for a 6" round Mug Rug! Wrap 144" for a 7" round Mug Rug! 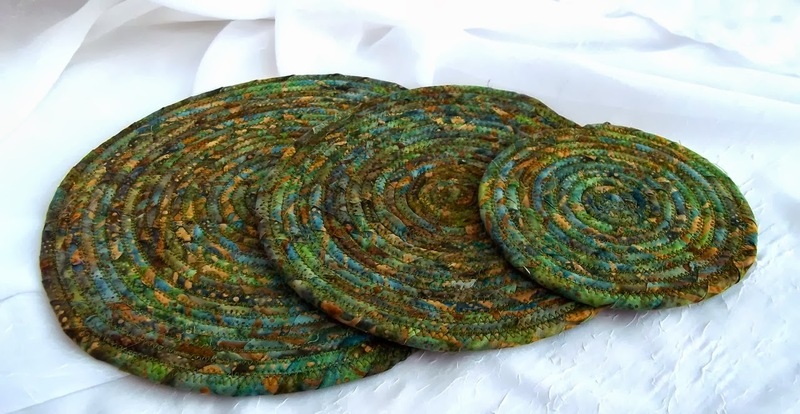 Wrap 180" for a 7.75" round Trivet! 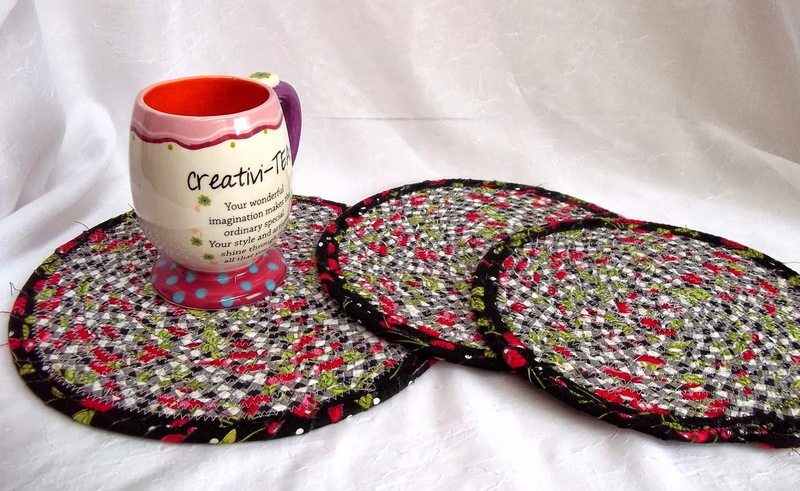 Wrap 216" for a 8.25" round Trivet! Yes, 6 yards of wrapped line to make an 8" Trivet! As the circle expands, it takes even more line to increase the diameter by an inch. I love using striped fabrics, since they create such a fun pattern. But batiks are wonderful too! I love trying new designs. I call it The Dog Bed since it is so unique and big. I love the rounded sides, makes this more like a cat/dog cave. My made this fun bed using my Singer Heavy Duty machine. The size of this machine restricts the curve, so I can only add a nice curve to larger beds: 12-15 inch base beds. I found this rich black and brown flannel fabric. My little fury friend loves hers, it molds to her curled shape. Kozy! She is so cute when she pops her head up to see what is going on! Custom Order - You Design it! I get to work with great people who want something unique for their specific need/use. I have created over 500 unique baskets. I design all my own work and do not use a pattern. 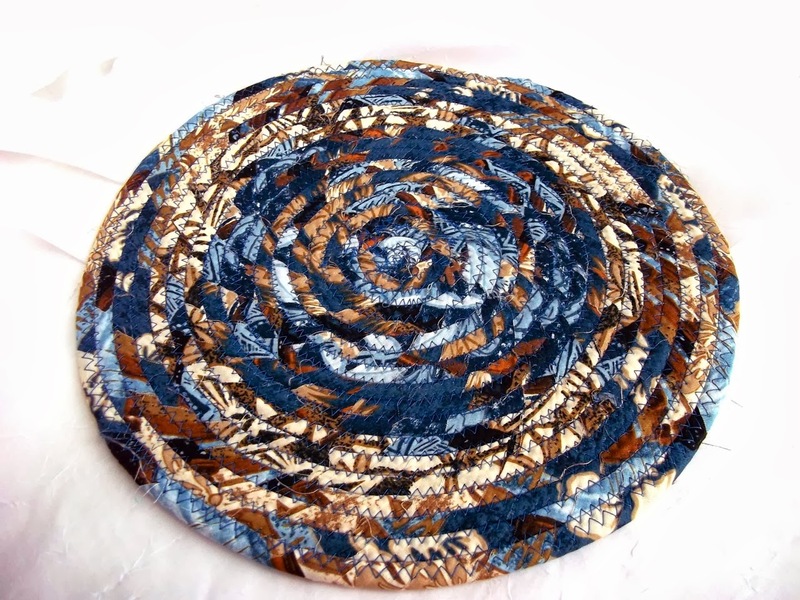 Every fabric and fabric combination creates a unique pattern in the basket. The size and shape of the baskets are usually functional, since I use them all over my own home. I use them for home decor and home storage. I'm trying to go more "Green", so I use a medium basket for shopping! Try a larger basket for your projects. My project bag/basket is now 3 years old and it goes everywhere with me. Yes, it has been washed many times and still looks great. I thought is would fray more, but it has not. I think that is because I only air dry it. Yes, machine washed with cold water. Go Green with gift baskets! A lovely customer asked for a Holiday Pie Carrier, great idea! Just don't forget it at your family's house! I would use a foil pie plate so you can leave that, but take your lovely basket home. 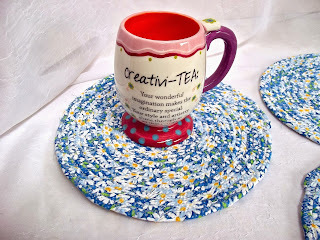 I don't include pie plates in my listings to keep the shipping costs low. Please feel free to contact me with your idea! I love it! I will be making more of these for my Christmas gift list.